Research is the bane of some authors’ existence, but not mine. I love researching the times and places in which I set my books and sometimes I wonder if I set out to place a book in some new time or area just so I can spend lovely hours staring at photos of England or Germany, or reading weird and wonderful history of Yorkshire England, Belgium, The Dark Forest region of Germany. I adore researching artists of the time and study old paintings for clothing details, landscape, houses. But as much as I thoroughly enjoyed researching Germany and despite setting the first two books of my paranormal Awaiting series there, I then moved Book 3 to England. I had wanted to take the series to Russia, but after some prodding from my editor, I caved. After all, I know the truth: North Americans are much more likely to buy a historical romance if it is set in England. Why is that, do you think? Why do we have this connection to all things British (and in many cases, Scottish). Is it those aristocratic titles? Lord Handsome-DeVille, Lady Lovely? Or is it those beautiful, stately houses: castles, manors, halls, lodges, parks, mansions? I think that for many of us it is the sense of the exotic, but still recognizable. We may know next to nothing about English history, but it feels familiar, perhaps soaked into our DNA from years of BBC and PBS teleplays, movies and documentaries. 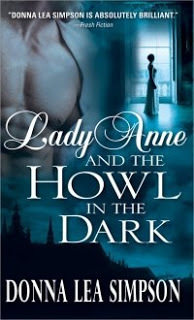 I set Lady Anne and the Howl in the Dark (Sourcebooks Casablanca – April 2009) in Yorkshire, but also I set it in 1786, the late Georgian era, which, given that most of my knowledge is about the Regency period, altered the amount I knew about both the area and the settings, giving me lots and lots of lovely research to do! So… why Yorkshire? Well, that particular county is big and rugged (kind of like the hero, Lord Darkefell) and moody and mysterious (again, Lord Darkefell) and a little wild, with the sense that anything can happen there, and—you got it—that echoes my sense of Lord Darkefell’s personality. There is murder and mayhem in ‘Howl’, and dark secrets, and the people of Yorkshire have historically been viewed (fairly or not) as close-mouthed and secretive. Even his title, ‘Marquess of Darkefell’, held the sense of mystery and referred to the faintly ominous Yorkshire ‘fells’, the rocky highlands. In essence, I was using Yorkshire as kind of a shorthand for certain moods and feelings I wanted to convey. It is no surprise that the prototypical Gothic romance (or anti-romance) novel of all time, Wuthering Heights, makes use of that same sense of menace and danger. It seems to me that different parts of England come with notions attached, as realistic or unrealistic as they may be. When I was working on the overall idea for the Lady Anne series, I knew it was going to be set in England. The book starts with a murder and a meeting between Lady Anne Addison, a stubborn nosey spinster, and Lord Anthony Darkefell, a powerful, moody marquess. So to get that kind of mood of menace and darkness, there was only one place in England right for the first book; Lady Anne and the Howl in the Dark would take place in Yorkshire. I do want to stress here, though, that this has everything to do with perception and legend and nothing with reality. It is the world I am imagining for my series, and I’m making use of fictional archetypes, which are just that, fictional. I would imagine most Yorkish folk are quite cheery, and not all that mysterious. I have a close relation who is originally from Yorkshire, and she is vivacious and talkative. The second book, Lady Anne and the Ghost’s Revenge, (Sourcebooks Casablanca – August 2009) has Anne scurrying away from Yorkshire and heading south, kind of like a modern day woman would escape south to somewhere tropical, warm and sunny. So where would that be in England, I wondered? Well, Cornwall, of course. Did you know that palm trees grow in Cornwall? Not naturally, of course, and not in the Georgian time, in which Lady Anne is set, but it is that warm and sheltered, the perfect place for a gal to get away from it all. But Cornwall is also known for its smugglers and the standoffish nature of those who have been trying to protect their native language—Cornish—for quite a long time now. That insular attitude, and a sense that the people close in against ‘outsiders’ made Cornwall the perfect place to set the second book, because it echoed the claustrophobic sense in the novel that something is going on, but people aren’t talking about it, especially to an outsider like Lady Anne. But for the third book, Lady Anne and the Gypsy Curse, (Sourcebooks Casablanca – November 2009) where Anne is really thinking things over, (including the memorable Lord Darkefell) I sent her home to Harecross Hall, in the eastern part of Kent. My sense of Kent is that it is often lovely and serene, warm in summer, an agricultural paradise for the hops growing industry of the Georgian period. It represents, for Anne, peace and harmony, family, home. And yet, she can’t stop thinking of the wild and rugged Yorkshire. And wild and rugged Lord Darkefell. If other writers are like I am, then their settings are not arbitrary, but mean something to the plot and characters. For those of us readers and writers of fiction set in England, the various parts of the country become symbols, in a way, or motifs to use as background fodder, or even as part of the characterization. Bath, England equals genteel and valetudinarian. Bristol? A bustling shipping port, active and industrious, busy. The Cotswolds… a bucolic and gentle place of rolling hills, quaint villages and stone cottages. How do those who reside in England feel about this, I wonder? It’s flattering, I suppose, to their country that so many of us write about it, read about it, dream about it, and make up itineraries of places we’d like to go, things we’d like to see. I’d like to visit Steventon, of course, and see the Pennines, walk the Dales, visit Bath. I’ve been to London, taken a boat along the Thames, and had my photo taken in front of Buckingham Palace. The England of fiction is probably a different country than the real thing, but it’s a place we all happily visit. I don’t see that changing any time soon. As long as people read Jane Austen and Charlotte Bronte, modern writers will set their romances there, in that fictional England. To visit my fictional world, and learn more about Lady Anne Addison and Lord Anthony Darkefell, come see me at http://www.donnaleasimpson.com/!